At your first visit to our office, our top priority is making sure you feel welcome and ensuring all of your needs and concerns are addressed. 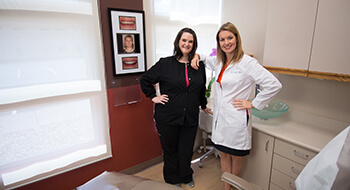 That begins with a one on one consultation with Dr. Susan Kutis. During this discussion, we establish your treatment goals and begin to create a personalized care plan. Then, you’ll receive a thorough cleaning by one of our hygienists and careful examination from Dr. Kutis. Before you leave our office, you’ll have a complete plan for keeping your smile whole and healthy going forward. If you’re looking for a new dental practice home, look no further that Blue Sage Dental. Contact us to schedule an appointment or find out more today. Dr. Susan Kutis understands that each patient has a unique story. Her goal is to help her patients have a great smile and a healthier life. Click on the video below to view an example of Dr. Kutis changing her patient’s life for the better. To Dr. Kutis, you’re not just a patient, you’re a part of the Blue Sage family. We strive to offer optimal convenience for patients, and one way we make your first visit quicker and more comfortable is by providing new patient forms for you to complete from the comfort of home. Simply click the link below, download the documents, and complete them at your convenience. Don’t forget to bring them along on the day of your appointment! We know how important it is to offer affordable treatment for our patients, and one way we ensure that this is possible is by processing and filing insurance claims. Additionally, we are in-network with Delta Dental Premier, offering these patients added savings at our practice. If you have questions, don’t hesitate to contact our knowledgeable team. For a limited time, we are offering a zoom whitening special, veneers special and a smile makeover special.